I've just discovered that my project "Cancer? 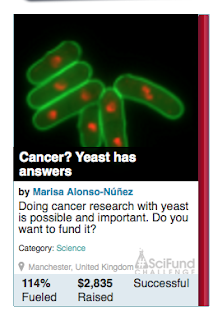 Yeast has answers" was one of the examples that Brian Meece, the CEO of RocketHub, mentioned in his talk about crowdfunding science at the TEDxBrooklyn. Actually he does a very good summary of what the SciFund challenge was and the key points to have a successful project to get funds for your research project by crowdfunding. And one of those key points is the rewards you give back to the people who decide to donate money to your project. In this part, my project got his attention and he used it as an example of interesting rewards. He mixed the ideas of sending a copy of the paper and getting the name of the contributors in the blog post about the challenge, and said that I was offering having the name of the contributors in the paper. That it´s not true.